Former White House lawyer Ty Cobb says Robert Mueller did a “thorough and professional job” in his investigation into Russian election interference and Donald Trump's conduct as president, though he disagrees with Mueller's decision not to clear Trump of obstruction of justice. Cobb, who oversaw the White House response to the investigation for almost a year, said Mueller and his team took an overly broad view of obstruction. They came to the right conclusion in affirmatively exonerating the president of the underlying crime of collusion and electing not to find misconduct in connection with obstruction,” said Cobb. After Trump fired James Comey, the White House spokeswoman Sarah Sanders repeatedly claimed in live press briefings that the rank and file of the FBI had lost confidence in the FBI director, and that “we've heard from countless members of the FBI” who did not support him. Those statements had no basis in fact, Sanders later admitted in interviews with special counsel Robert Mueller's office. Sanders, the current White House press secretary, told the special counsel's office that a statement she had made to journalists about the Comey's lack of support within the FBI “was not founded on anything”. With the Mueller report behind the Trump administration, how do they move forward and focus on 2020? 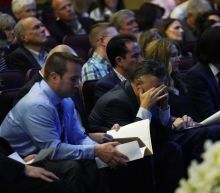 A Colorado community changed forever by the attack that killed 13 people at Columbine High School moved ahead Thursday with ceremonies marking the anniversary of the tragedy while awaiting more details on what led a Florida teen "infatuated" with the shooting to buy a shotgun and kill herself in the snowy foothills nearby. Many questions remained unanswered about 18-year-old Sol Pais, but a friend disputed the contention by authorities that she posed a threat. Adrianna Pete painted a complex picture of Pais, saying she was deeply troubled, lonely and often talked about suicide but was also brilliant, kind and a talented artist who loved to draw. Alexandria Ocasio-Cortez says the Mueller report has convinced her that Donald Trump must be impeached. The Congresswoman said she had resisted calling for the president to undergo investigation, and that she would rather work on other priorities, but that the behaviour detailed in the newly released report had forced her to back calls for his removal. Ms Ocasio-Cortez said she took "no pleasure" in the discussion, "but the report squarely puts this on our doorstep".